I have not even touched my computer for the past three days and it feels amazing. This Sunday morning, or afternoon I suppose, is the first time I have had a chance to sit down with a cup of tea and just rest. I've been here a little over a week, but I've been so productive with seeing the sights that it feels like I've been here so much longer. All of the 40 people on the trip have become like a family, as cliché as it sounds. It's like freshman year of college when no one has any friends so you make them so quickly. Friday a big group went to the Guinness Storehouse. We walked around the factory, seeing how they make the beer and learning about the history of Arthur Guinness' business. He actually signed the lease for the factory building for a period of 9,000 years. Who does that?! Someone drunk off of his own drink, apparently. Either way, I guess it's a good business move. I wasn't able to take too many pictures because it was really dark, but I got a few. Here's the Irish equivalent of the pearly gates. Then Casey, Colleen and I copied other Americans and took a picture by this red wheel. It's crazy how much Colleen and I look alike in pictures, except for the obvious height difference. We made a pit stop at the café and I had the most amazing dessert of my life: a chocolate Guinness cupcake. My favorite part of the storehouse was the floor of old advertisements. The famous toucan actually started out as a pelican and the campaign was that it could hold something like seven pints of Guinness on its beak. 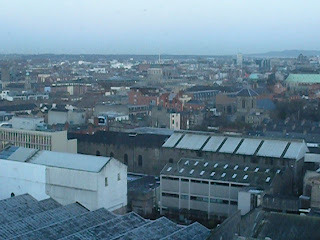 Then we went to the highest point in Dublin, the Gravity Bar. Everyone gets a free pint of Guinness with admission, so we all enjoyed them while watching the sun set. My taste for the stuff has gotten a little better, meaning I could get through about half the glass as opposed to only a few sips before. I'm still nowhere near doing justice to my Irish roots, though. Friday night was also eventful. Since there are so many of us, we can't all go out in one huge group. Nothing says "no admittance" like a group of 40 American students. I opted to leave with the second wave of people, but once we got wind of a seven Euro cover, we decided to follow Mike to a bar that was allegedly right outside our campus. After walking through two suburban neighborhoods and happening upon a muddy field, I was done with the adventure. A few of us turned around, but they ended up finding a place a while later. We sucked it up and paid the cover at McGowan's and it ended up being a good time. Saturday's plans to head to the coast were ruined when some heavy duty fog rolled in early on in the morning. This stuff was not messing around. We opted for exploring the city instead of spending an hour on the train only to be swallowed in fog at the coast. Colleen and I are the designated tour guides and planners. The National Gallery of Ireland had free admission and a great collection of Irish, Italian, French, Spanish and Dutch art. Cameras weren't allowed so I took some illegal pictures. Then we found an adorable little café, where I had an apple cinnamon crepe, with fresh strawberries and some tea. Our sightseeing day ended with a trip to Dublin Castle. We didn't take a tour of the inside, but we were able to enjoy the outer walls. It's kind of a shame that the city has allowed for crappy 1970s architecture to be constructed in and around the castle as it somewhat ruined a few views, but I mean, it's a castle. It's awesome. And I was obsessed with this gate. Whew. Well now it's another foggy day, but we're spending it inside relaxing for the first time. No one feels like they can waste a moment not seeing the sights and taking advantage of living in Ireland, but the consensus was unanimous today. Pj's, blogging and tea. You didn't finish a free beer? I just lost some respect for you. I concur with Doug, but this still enjoyed living in the guiness factory through your pictures. AY GUINESS!